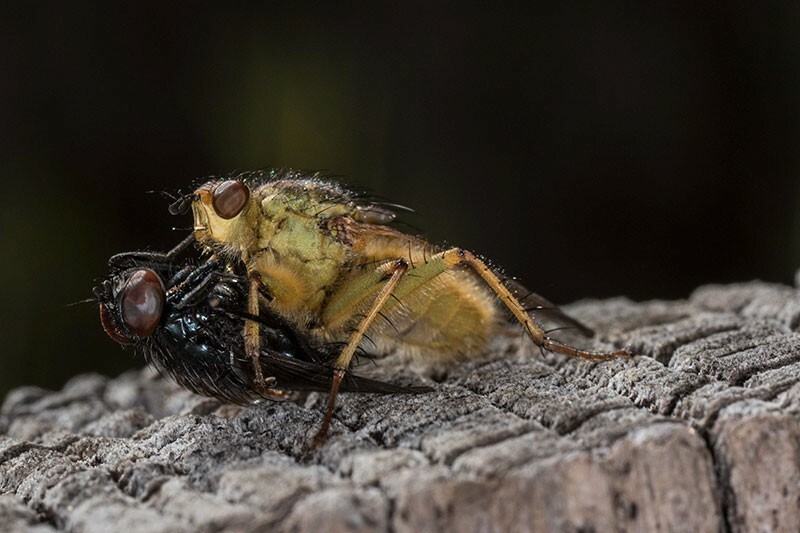 A dung fly and its victim. A couple of days ago while working in my front yard, I noticed insects flying around down near ankle height. Taking it as an excuse to stop working I paused and watched. Soon enough one landed. I was able to identify it as a 'golden dung fly' (Scathophaga stercoraria), a species with which I am familiar. As its name implies, its life revolves around animal droppings, especially those of large herbivores. 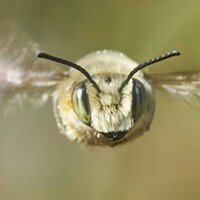 They spend their larval stage feeding on it, and as adults hang around preying on other insects attracted to it, finally laying the eggs of the next generation in it. They are agile aerial hunters. I have seen them taking insects as large as themselves on the wing. While they are not aggressive toward humans (we're a tad large for them to carry off), I can attest they can bite if mishandled. So, what's with the “zombie” thing in relation to this insect? Last spring right after getting my super-duper macro lens, I went ahunting. I took pictures of everything including some of this species posing, some with prey, and finally perched atop some of the tallest sprigs of grass in my recently mowed lawn, dead. When I downloaded the images I noted many of the deceased ones were covered with a clumpy white growth, especially where the plates of their exoskeletons joined. 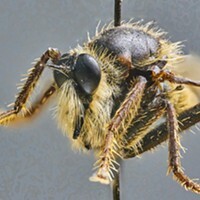 A bit of research online indicated it was most likely Entomophthora muscae. This is a fungus which attacks, infiltrates the bodies, feeds on the tissues, enters the central nervous system and causes the insect to land, climb to the top of a tall sprig, lock up and finally die. The fungus then erupts through the soft parts of the body and disperses its spores to attack another generation of flies. Sometimes Mother Nature is not all that nice.